Here is a 5 minute TV Taster video. 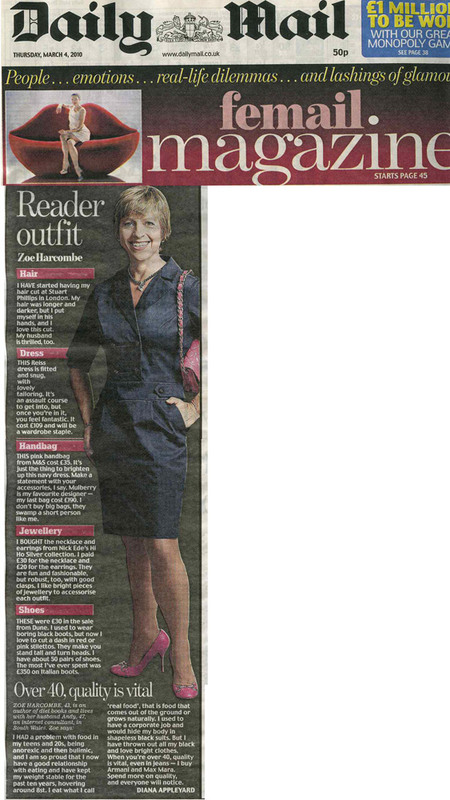 A huge thank you to Simon Mansfield, Sarah Broughton and Sarah Howells at Modern TV for doing this. 7/4/2019 – Talk Radio – The Mark Dolan show – talking about low carb diets and healthy eating generally. 13/2/2019 – Talk Radio Europe – Why cholesterol can’t cause heart disease – audio here. 30/1/2019 – BBC Radio Berkshire – Actors who lose and gain weight for film roles. 14/1/2019 – BBC Radio Berkshire – The BNF portion size story. 9/1/2019 – Get the Gloss – Fake news about diets we shouldn’t fall for. 7/1/2019 – Get the Gloss – Time restricted eating. 7/1/2019 – The Independent (Ireland) – Here’s the plan: I’ll tell you how to lose weight and keep it off forever. (I’ve missed quite a few regional BBC radio shows, as I forget to update this! I do an average of one every week or two). 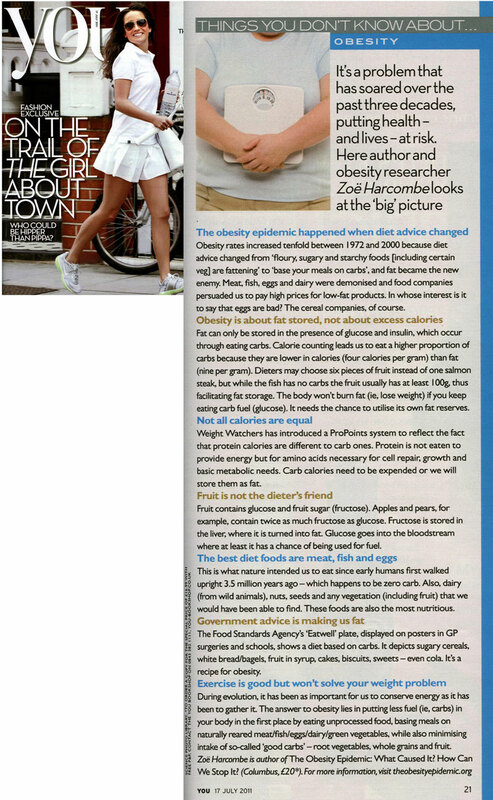 29/12/2018 – The Diet Fix feature in The Times Magazine. 13/12/2018 – Talk Radio Europe – All about cholesterol, statins and LDL – based on this article and this one. Listen here. 6/12/2018 – BBC Birmingham – Danny Kelly. Christmas eating tips. 8/11/2018 – Podcast with Jon Gaunt – Cholesterol, fruit and all sorts. 25/10/2018 – Talk Radio Europe – All about Vitamin D. (If it’s still available on line, pick the 10-11am slot and I’m 30 mins in to this). 23/10/2018 – BBC London – The Vanessa Feltz show. Talking takeaways and obesity. (If it’s still available on line, I’m on at about 1 hr 17 mins). 23/10/2018 – BBC Birmingham – Danny Kelly. Talking top foods for type 2 diabetes. (If it’s still available on line, I’m on at about 1 hr 10 mins). 23/10/2018 – BBC West Midlands – Paul Franks. Talking takeaways and obesity. (If it’s still available on line, I’m on at about 8-9 mins into the programme). 10/10/2018 – Podcast with Ben Pratt. Nutrient density helps weight management. 3/10/2018 – BBC Three Counties Radio. Talking about Steve Miller saying that parents need to sort childhood obesity. 2/10/2018 – Podcast with Diana Rodgers (Sustainable Dish) – Nutrient density, red meat & politics. 27/9/2018 – Podcast with Chris Kresser – The Truth about saturated fat. 20/9/2018 – Talk Radio Europe – All about that low carb study. 12/7/2018 – Talk Radio Europe – Anti-depressants and weight gain. 23/5/2018 – Three Counties Radio. Childhood obesity. 23/5/2018 – Talk Radio Europe – Childhood obesity. 22/5/2018 – Podcast with Brian Sanders (Food Lies) – The Weird and Backwords World of Nutrition. 1/5/2018 – BBC Radio London – The Jamie Oliver obesity initiative. 5/4/2018 – Talk Radio Europe – 5:2 Diet and heart disease. 6/3/2018 – 16 BBC interviews scheduled on this story on drive time (between 16.00 and 18.00 GMT). 1600 Cornwall; 1608 WM; 1615 Manchester; 1622 3CR; 1630 Jersey; 1638 Newcastle; 1645 Wales; 1652 Leicester; 1700 Oxford; 1708 Cov & Warks; 1715 Nottingham; 1722 Sussex; 1730 Stoke; 1738 Lincolnshire; 1745 Humberside; 1752 H&W. These were the points I made. 1/3/2018 – Talk Radio Europe – All about fat. 27/2/2018 – LBC – The Clive Bull show – on this story. 26/2/2018 – Woman’s Hour BBC Radio 4 – talking about calorie counting. 1/2/2018 – Talk Radio Europe – talking about statins for children. Recording available here. 30/1/2018 – BBC Radio Tees – talking about this story – Britains having the worst diet in Europe. (I’m on about 20 mins in – available for 30 days only). 11/12/2017 – Daily Express – Donald Trump SUPERSIZE diet revealed: Can YOU out-eat the fast food president? 22/11/2017 – Talk Radio Europe – We can’t outrun a bad diet. 11/10/2017 – BBC Three Counties Radio (I’m on 1 hr 20 mins in – no longer available) and BBC London (I’m on 1 hr 50 mins in – no longer available) – talking about the latest childhood obesity figures in The Lancet, reported here. 21/8/2017 – LBC – The Clive Bull show – on this story about sedentary behaviour and the latest Public Health England release. 5/7/2017 – BBC Three Counties Radio – The JVS show (no longer available) – helping an obese listener, Glenn Phillips , to lose weight. 8/5/2017 – Two radio interviews on banning junk food ads before 9pm. Three Counties Radio – The Roberto Perrone show (no longer available) & BBC Berkshire – The Phil Kennedy show (no longer available). 4/5/2017 – Talk Radio Europe – The Professor Tim Noakes trial in South Africa & Running 1700km on fat! Available here. 30/3/2017 – Talk Radio Europe – South American tribe and heart disease. Available here. 8/3/2017 – Talk Radio Europe – talking all things health, diet, food and low carb Breckenridge conference. Available here. 20/1/2017 – Talk Radio Europe – The NHS in Wales. Available here. 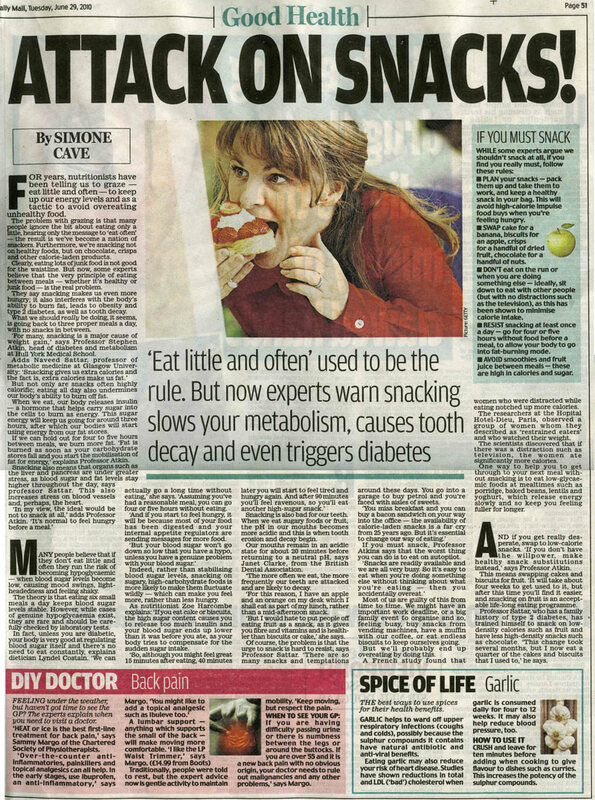 23/11/2016 – Daily Mail – Could you live off a diet of only fruit? 21/11/2016 – Radio Interviews on this five-a-day story. BBC 3 Counties radio 5.20pm; BBC Berkshire 6.20pm; LBC Clive Bull show 8.45pm. 11/11/2016 – Talk Radio Europe – Talking about the Professor Tim Noakes hearing. Available here. 3/11/2016 – BBC Hereford & Worcester – Low carb diets. 15/9/2016 – Talk Radio Europe – Talking about the Lancet statin study. Available here. 14/9/2016 – Newstalk Radio Ireland, Moncrieff Show – Radio interview on this story. 29/8/2016 – Radio Berkshire – Radio interview on this story. 19/8/2016 – Talk Radio Europe – Talking about Brits lying about cal intake (allegedly). 18/8/2016 – BBC5Live – Radio interview on this story. 22/7/2016 – BJSM Blogs – Will whole grains make you live longer? 21/7/2016 – BBC Hereford & Worcester – Radio interview on this story. 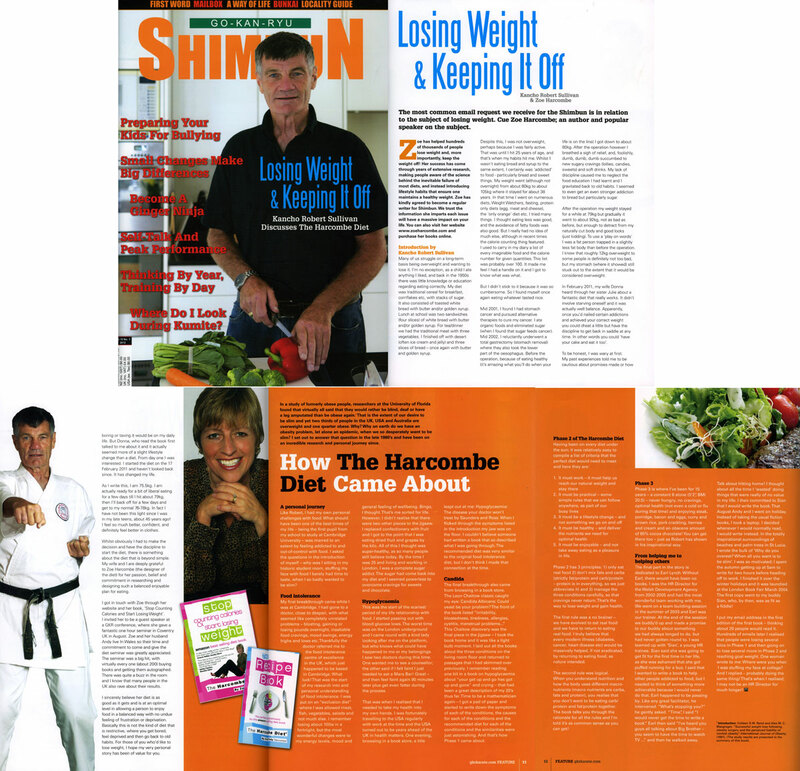 27&29/6/2016 – More BBC Hereford & Worcester Radio interviews on latest diet and health news. 23/6/2016 – BBC Hereford & Worcester – Radio interview on this story. 23/5/2016 – Interviews all day on the NOF/PHC report – reported here – BBC Radio London (Vanessa Feltz); BBC Radio Wales (Jason Mohammad); BBC Tees (Mike Parr); LBC (Clive Bull); The Mark Forrest show. 23/5/2016 – Talk Radio Europe. Real food & the PHC conference. Available here. 17/5/2016 – The Telegraph – Foods you’re most likely to overeat. 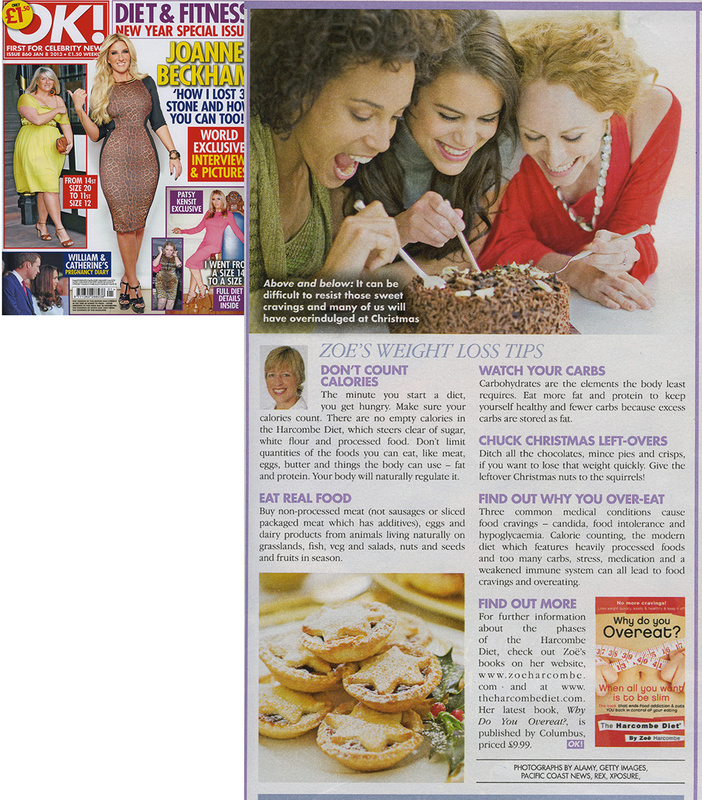 10/5/2016 – Bella Magazine – Curb your cravings. 9/5/2016 – BBC Radio WM (Adrian Goldberg) – The UK drop in bread sales. 5/5/2016 – BBC Solent talking about obesity generally. 3/5/2016 – BBC Radio WM talking about the Biggest Loser Story. 15/4/2016 – Radio shows on the Dolmio/Mars story: BBC London; BBC Solent; BBC Ulster; BBC Cumbria; BBC H&W; BBC WM; BBC 3CR; BBC Leicester; BBC Northampton; BBC Shropshire; BBC Merseyside; BBC Surrey; BBC Manchester; BBC Stoke; BBC Sheffield; BBC Coventry & Warwick; BBC Derby. 8/4/2016 – Talk Radio Europe – Talking about the latest obesity report in The Lancet. 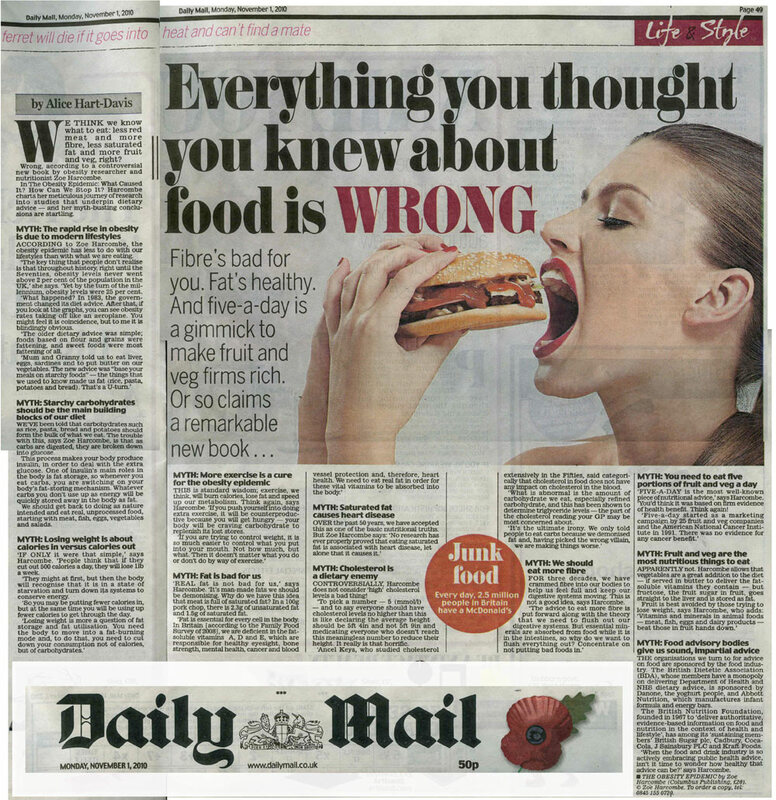 17/3/2016 – Daily Mail – The new Eatwell Guide. 15/1/2016 – Talk Radio Europe – US Dietary Guidelines. Available here. 27/11/2015 – Talk Radio Europe – Should we have a sugar tax? 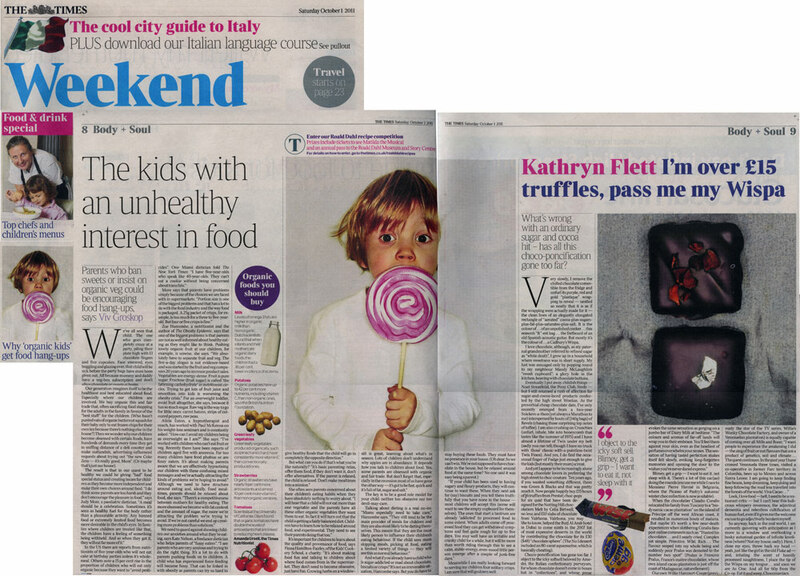 24/10/2015 – Mail on Sunday – Just how much sugar can a healthy family eat? 20/9/2015 – Dr Mercola interview – What really caused the obesity epidemic? 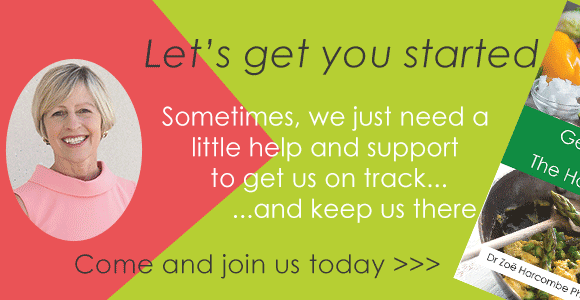 2/8/2015 – BBC London Sunny & Shay show – should benefits be cut for those who don’t lose weight? 1/6/2015 – Talk Radio Europe – Does obesity cause cancer? 8/5/2015 – ITV Tonight Programme – Eat fat, stay fit? 13/3/2015 – BBC Radio Wales – Should we be giving children sweet treats? 14/3/2015 – Talk Radio Europe – The obesity epidemic is government funded. Available here. 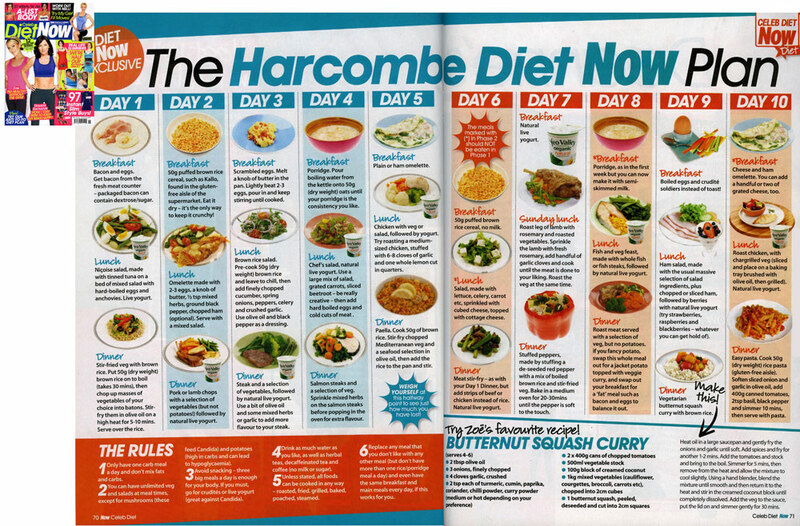 11/2/2015 – Daily Mail – Janet Street Porter – I gave up the most glorious food on earth for a lie! 10/2/2015 – media madness! This paper was published in BMJ Open Heart and Zoe did interviews on the day for c. 15 local BBC stations; BBC News TV; ITV News; Radio 4 Today programme. 9/2/2015 – Time Magazine – Where dietary fat guidelines went wrong. 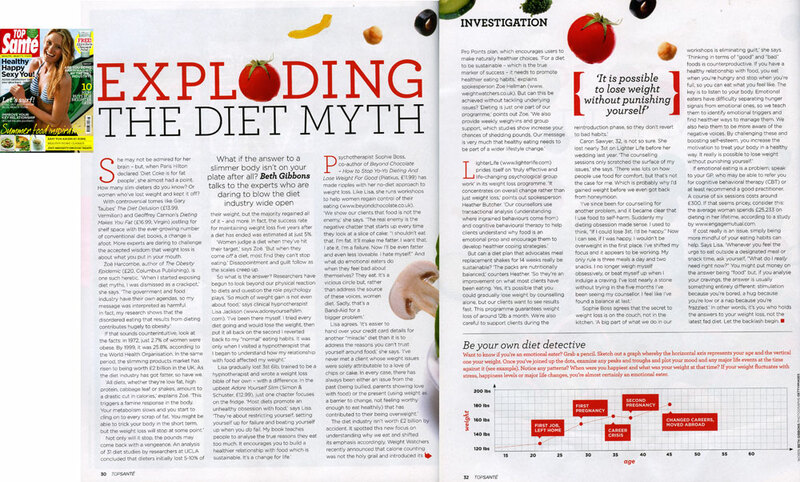 8/2/2015 – You Magazine – When does healthy eating become a disorder? 30/1/2015 – Talk Radio Europe – Liraglutide. 30/7/2014 – BBCWM – Five-a-day story again! 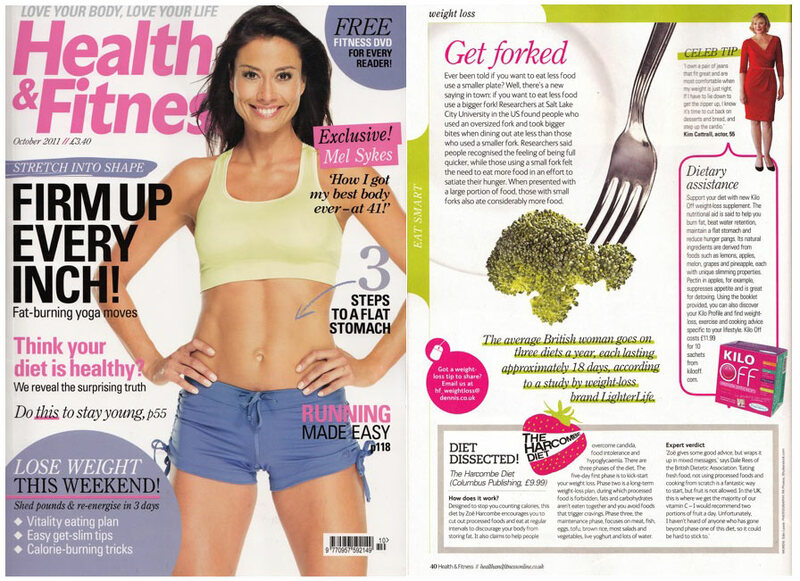 February 2014 – Essentials – Diets that actually work! 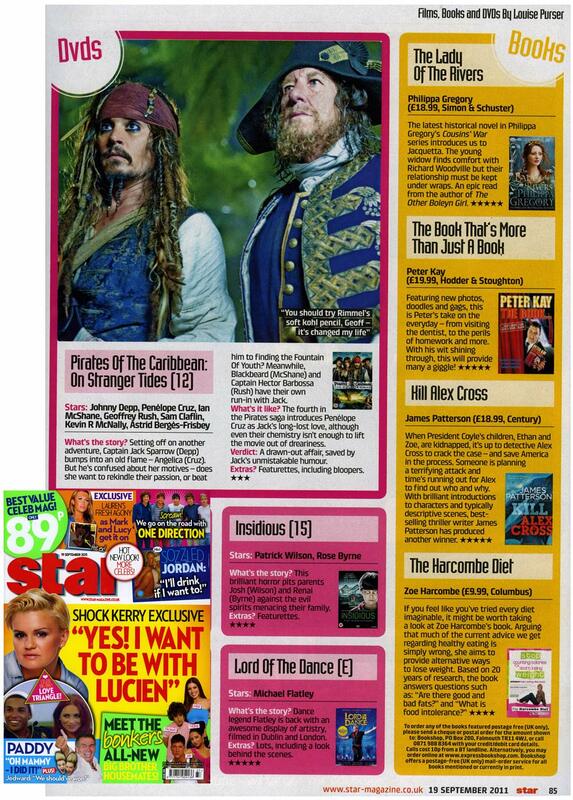 2/2/2014 – You Magazine – The hairy hunk we’re all lusting after – coconut! 31/1/2014 – BBC London – Vanessa Feltz – Are we a nation of couch potatoes? 17/1/2014 – BBC Radio Wales – Is sugar really that bad? 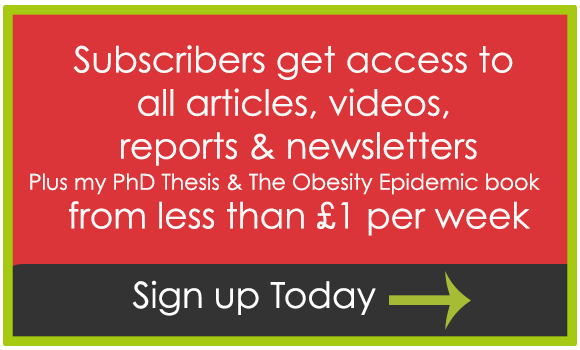 13/1/2014 – BBC Radio Coventry – Is obesity worse than we thought? 6/11/2013 – Real Radio – Should we tax soft drinks to curb obesity? 1/11/2013 – BBC Radio Wales – Should we tax soft drinks to curb obesity? 20/8/2013 – BBC Radio Wales – Should 11-15 year olds be sent to Slimming World? 16/7/2013 – BBC Radio Coventry – Are sweeteners unhealthy? 27/6/2013 – BBC Radio Coventry – BMA motion being tabled that day – should junk food be banned from hospitals? 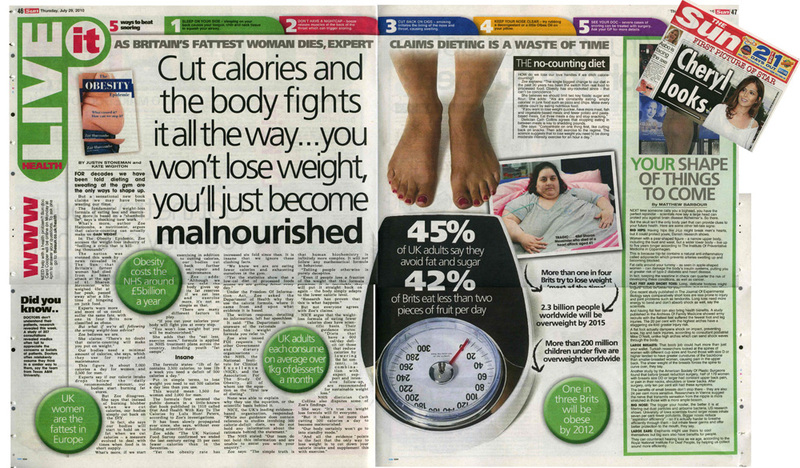 28/3/2013 – Daily Mail – Think a skinny latte will help you slim? 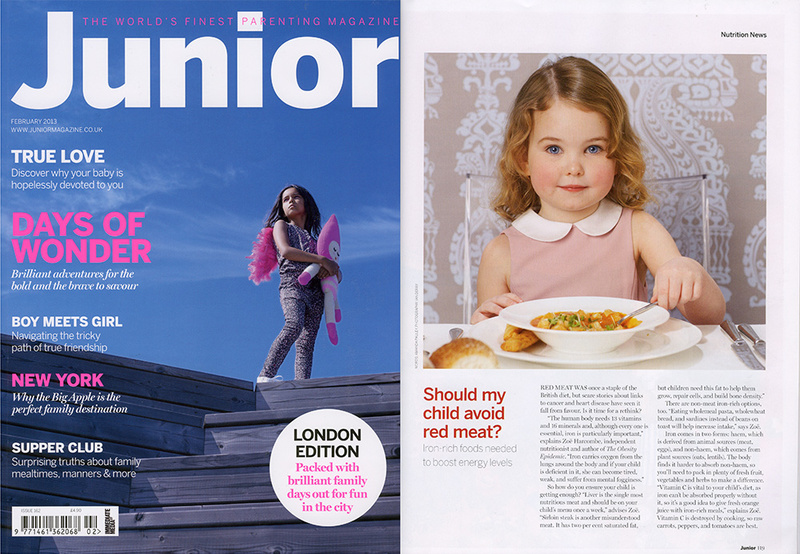 February 2013 – Junior Parenting magazine – should my child avoid red meat? 10/2/2013 – BBC 1 The Big Questions – Should we tax to fight the flab? 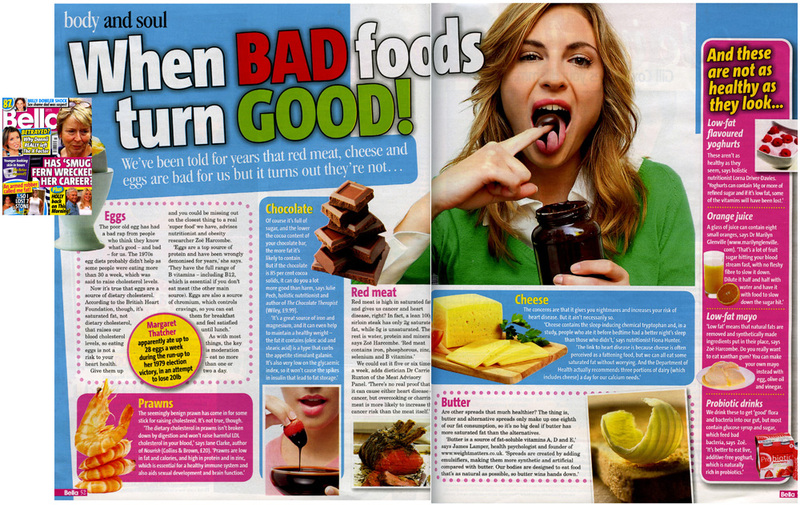 08/01/2013 – OK Magazine – Feature on Why do you overeat? 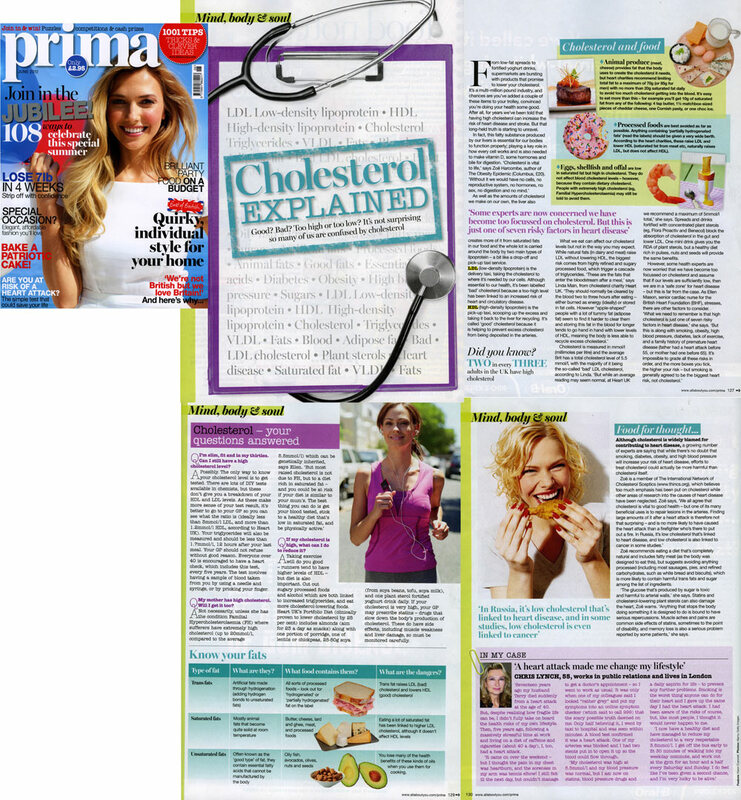 January 2013 – Prima – How much sugar does a jacket potato contain? 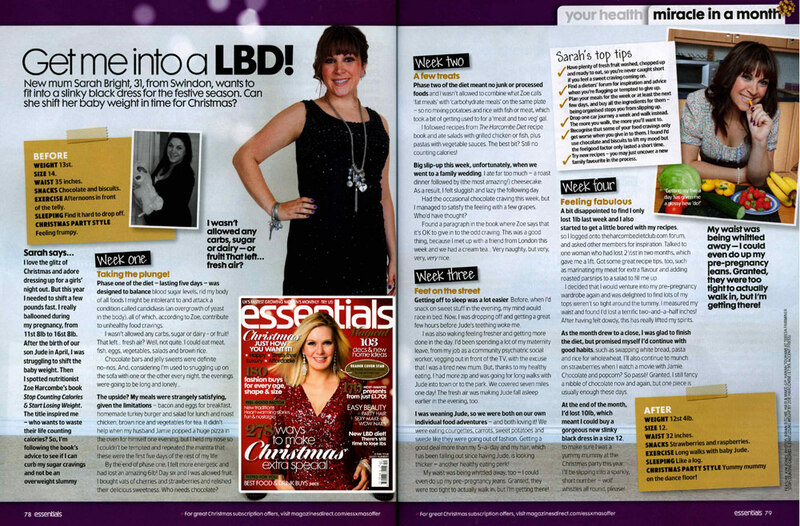 11/12/2012 – Radio Interview with Maria McCann – WLR fm – on Why do you overeat? 16/11/2012 – Interview with Pippa Jones on italkfm radio – Should we tax sugar? fat? 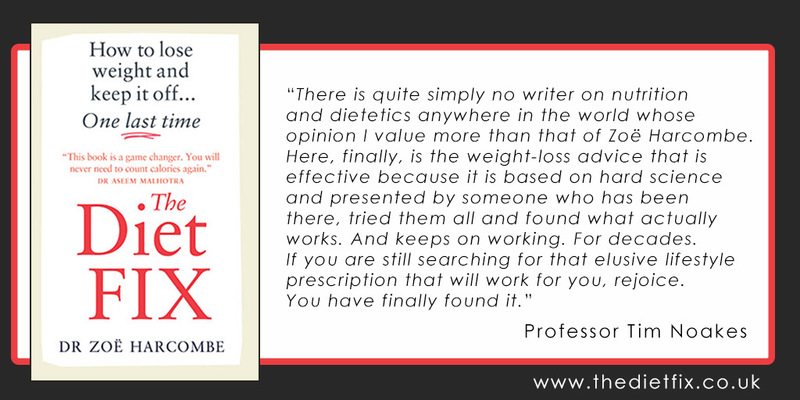 6/11/2012 – Interview with Pippa Jones on italkfm radio – Why is the media obsessed with weight? 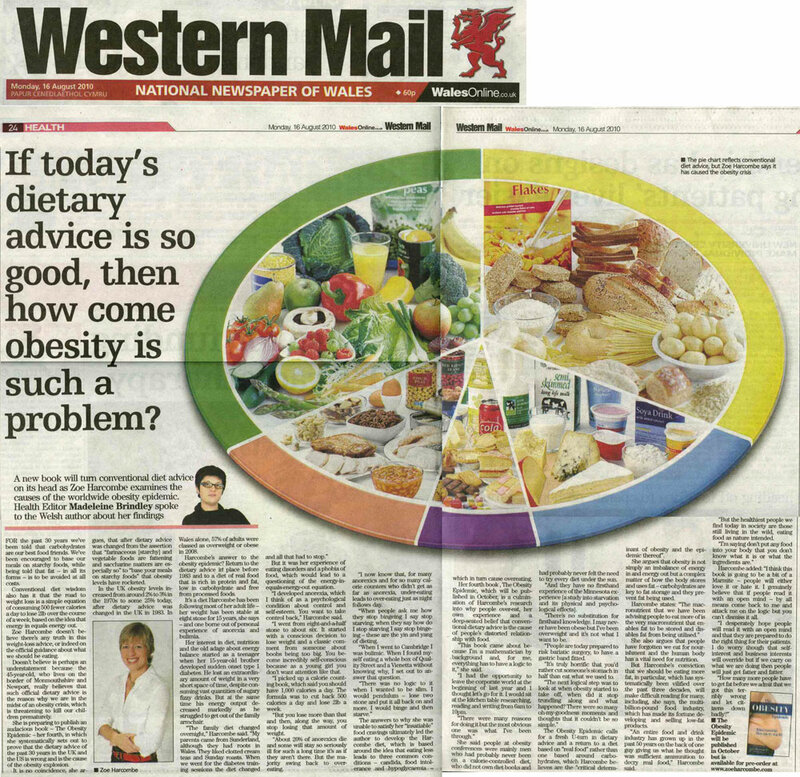 1/12/2012 – The Western Mail – What drives us to overeat? 18/10/2012 – Interview with Pippa Jones on italkfm radio – Is Jersey the last place in the British Isles with a healthy lifestyle? 24/09/2012 – Interview on Good Morning Wales – Is feeding children junk food child abuse? 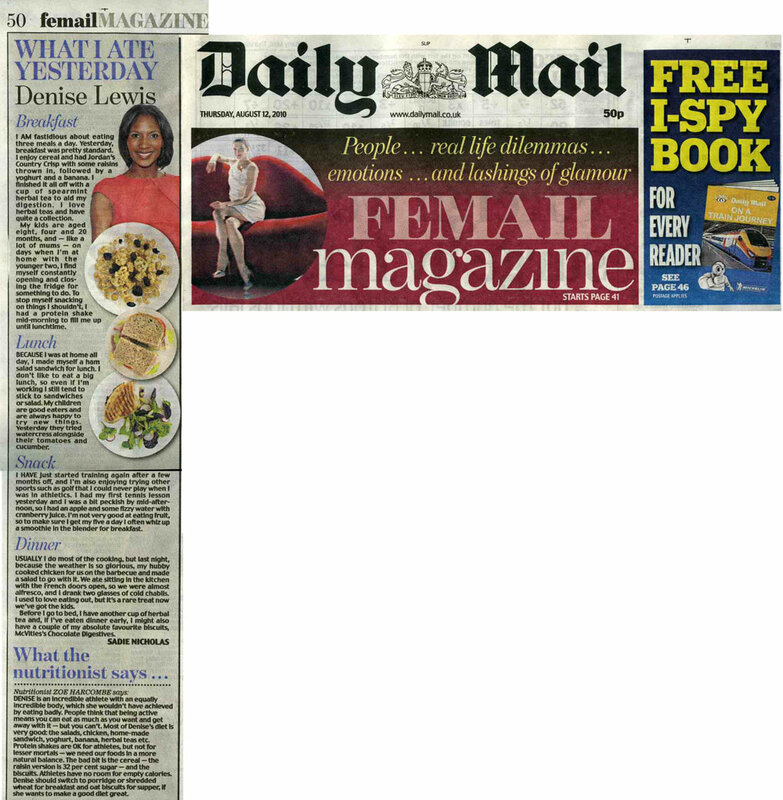 29/08/2012 – Daily Mail – Starve one day, then pig out the next! Is this the perfect diet? 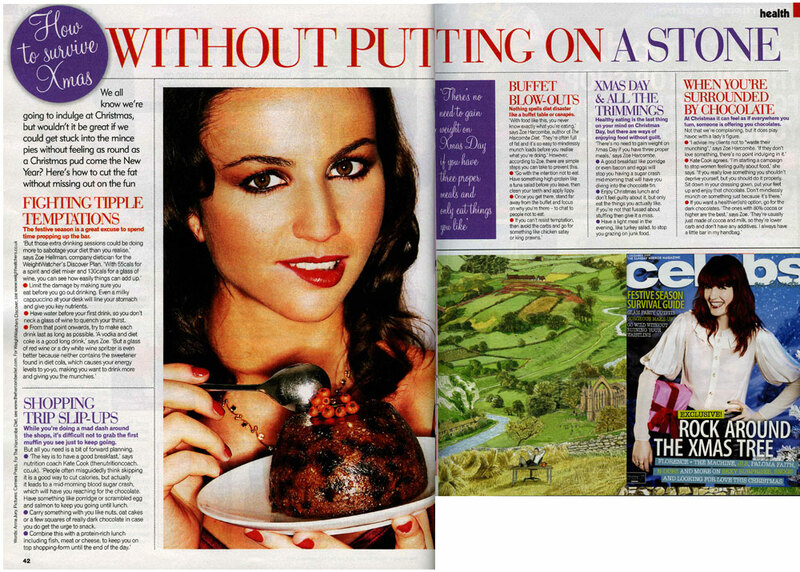 13/05/2012 – Mail on Sunday – Bring back butter! Spring 2012 – Pig & Poultry Marketing! 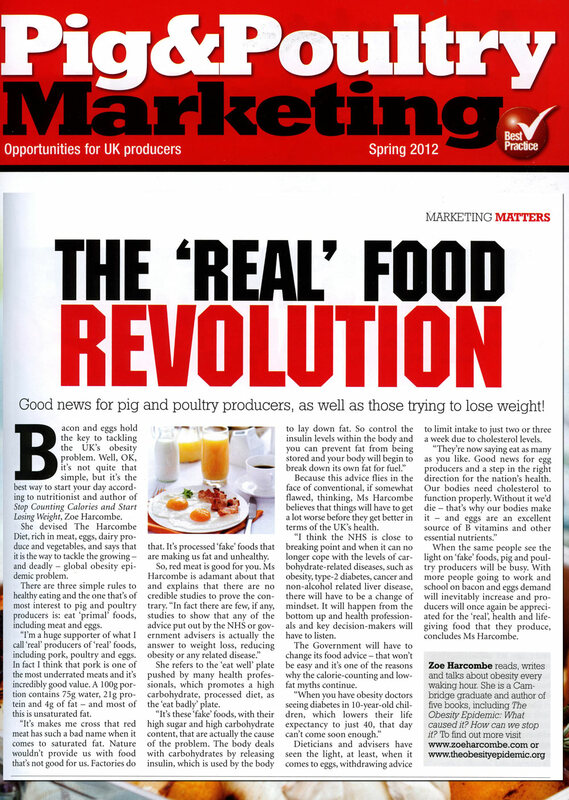 The ‘Real’ Food Revolution! 28/10/2011 – BBC Radio Wales Drive Time – should we have a fat tax? 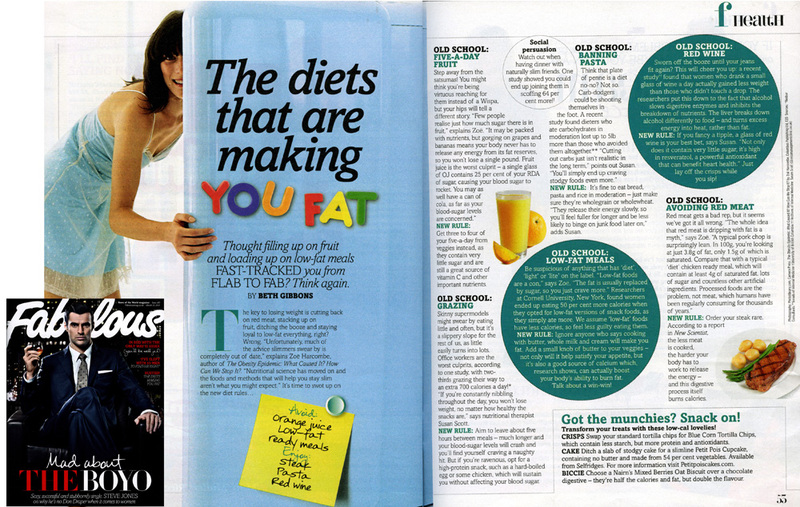 22/10/2011 – Heat Magazine Has Christina’s yo-yo dieting ruined her body? 27/8/2011 – Western Mail – No more Mr Fat Guy! 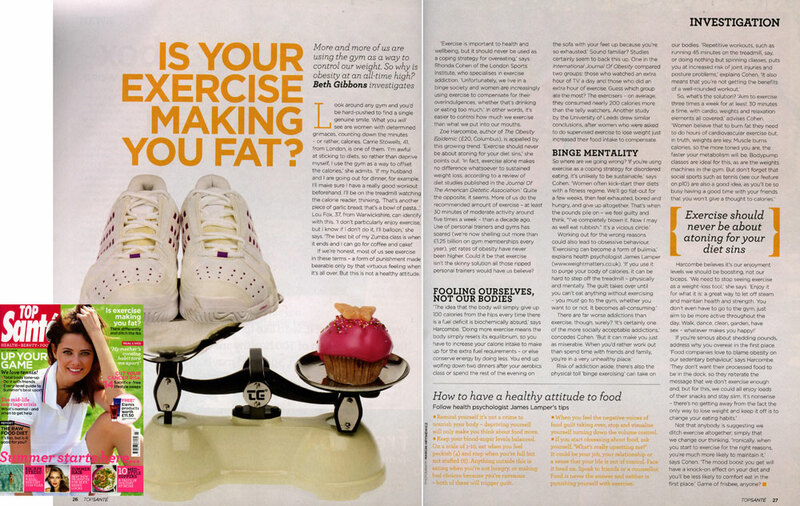 July 2011 – Top Sante – Is exercise making you fat? 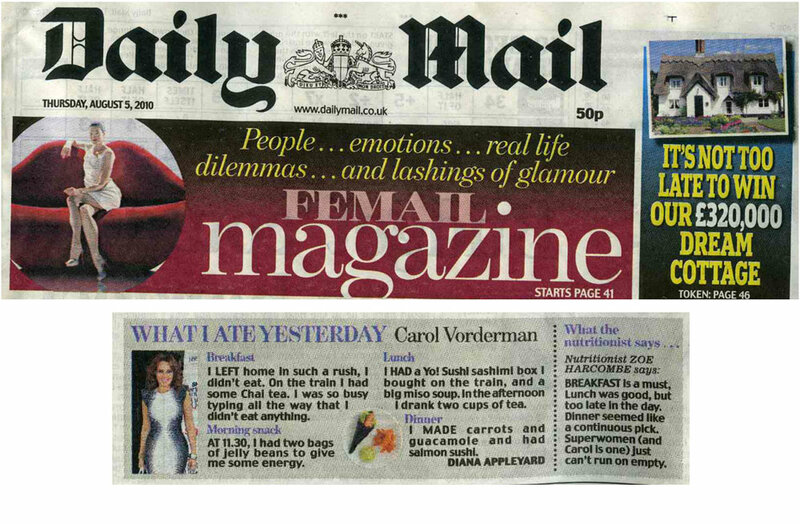 11/07/11 – Daily Mail – Is your shampoo making you fat? 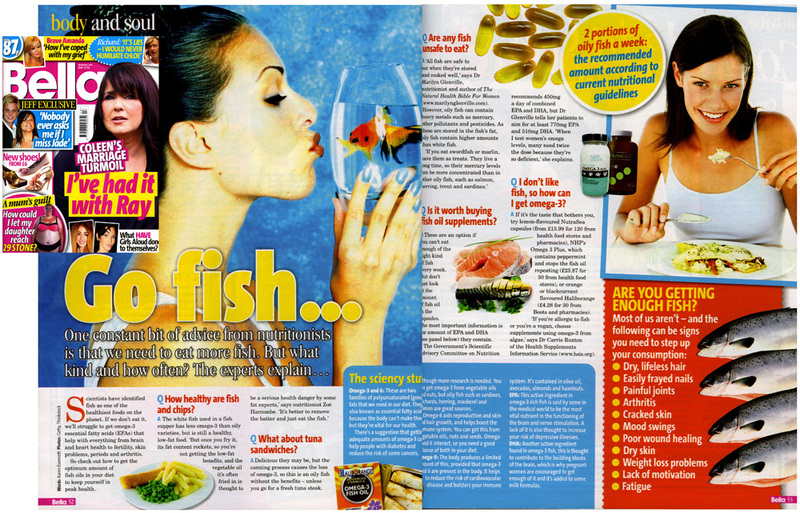 22/03/11 – Independent – Is five a day enough? 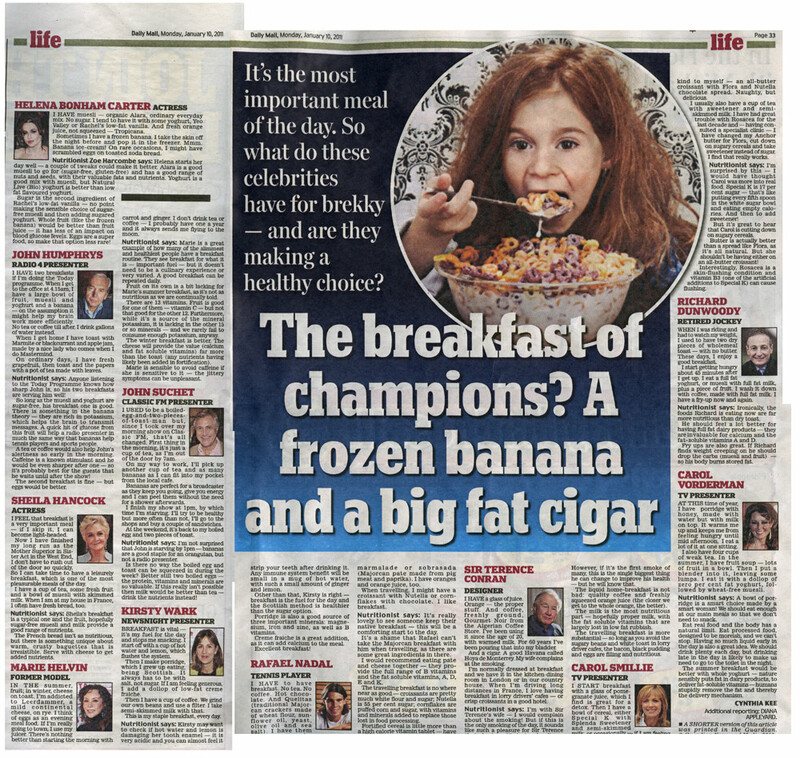 10/01/11 – Daily Mail – The Breakfast of Champions? 25/11/10 – BBC Newsnight interview on the forthcoming public health white paper. Available on iplayer until 2nd December. 23/11/10 – Wild 104 New York radio – interviewed by Louie G.
16/11/10 – The Epoch Times – The Obesity Epidemic: What caused it? How can we stop it? 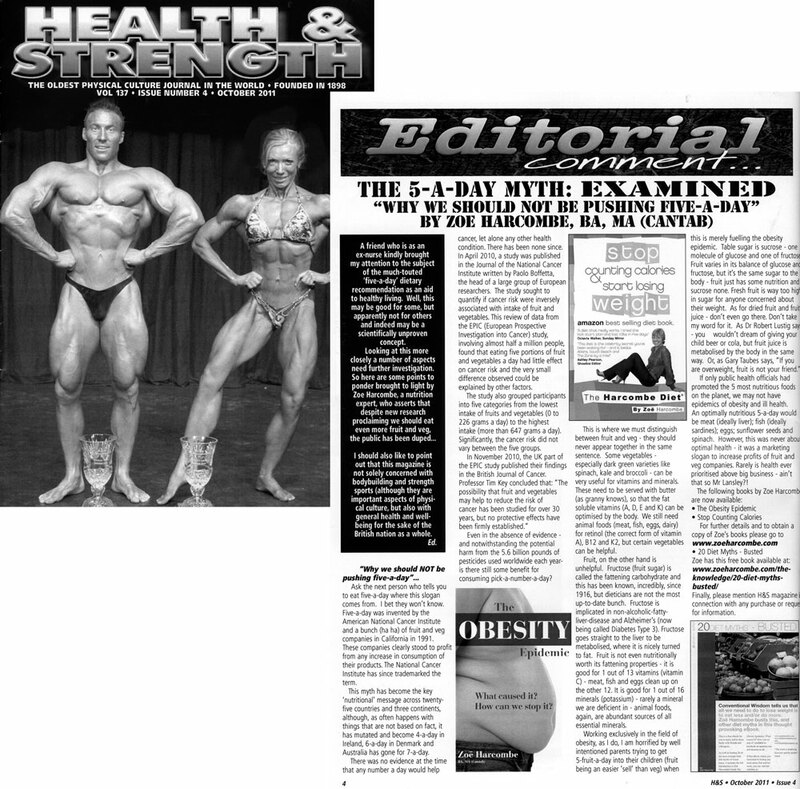 07/11/10 New York Post – Exercise & dieting big fat lies. 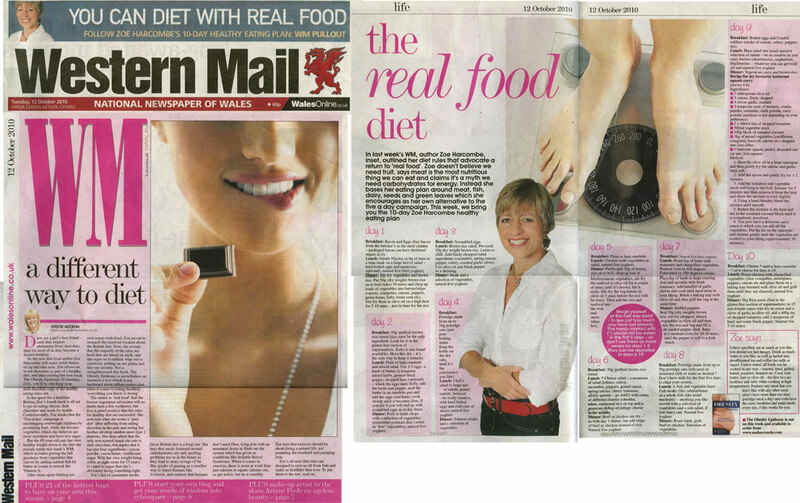 16/08/10 Western Mail – How come obesity is such a problem? 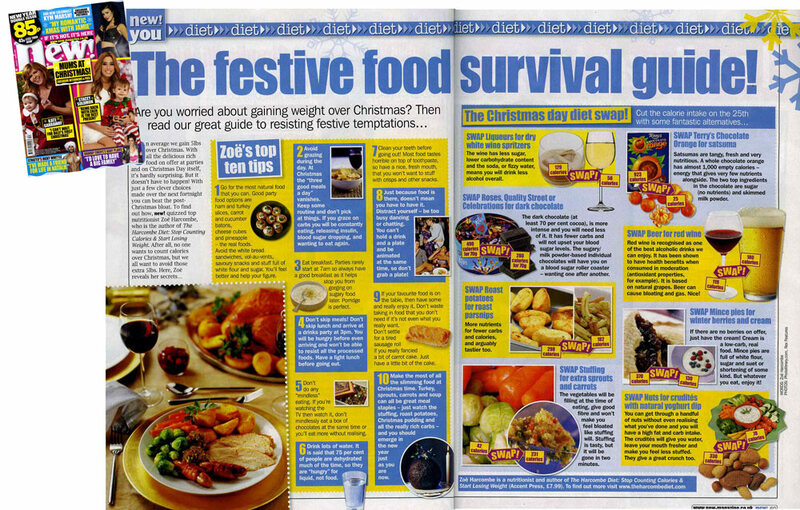 12/08/10 Daily Mail – What I ate yesterday, Denise Lewis; Daily Mail article. 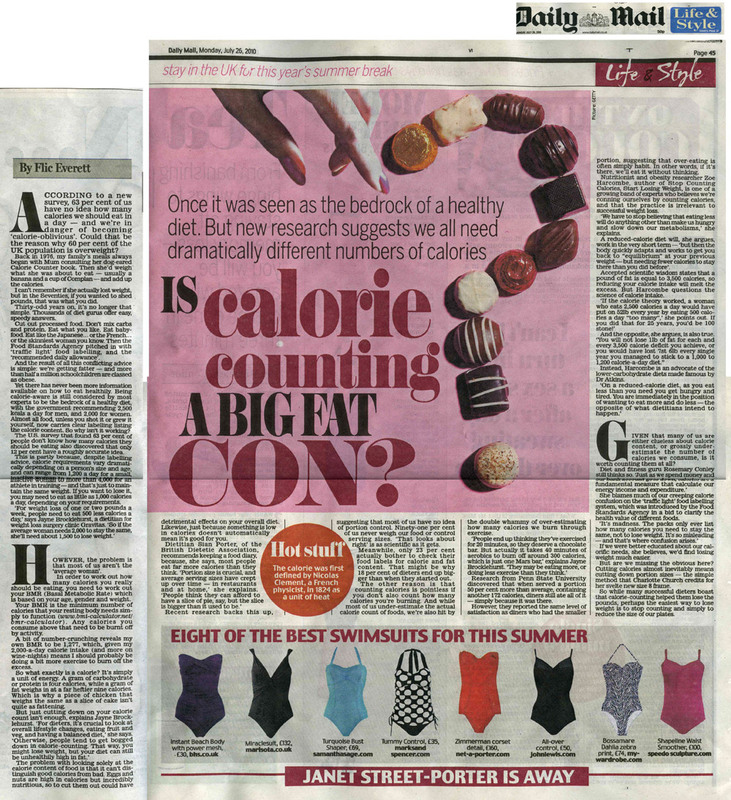 26/07/10 Daily Mail – Is calorie counting a big fat con? 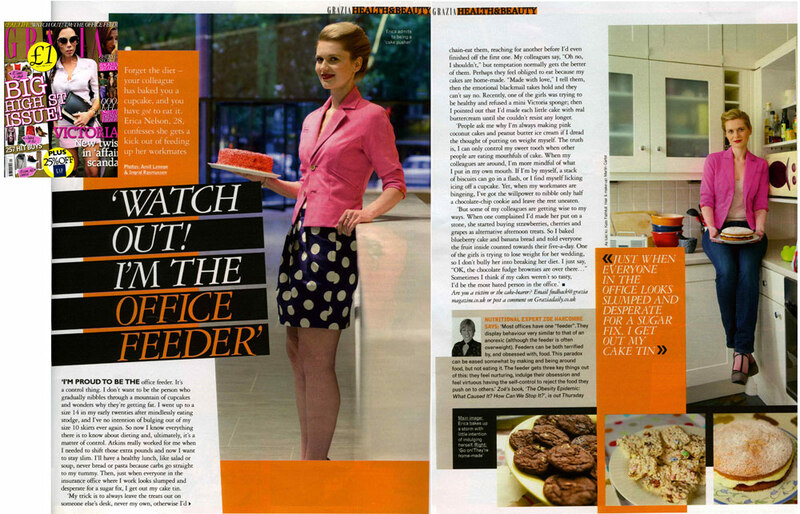 Sept/09 Glamour – What do magazine staff really eat? 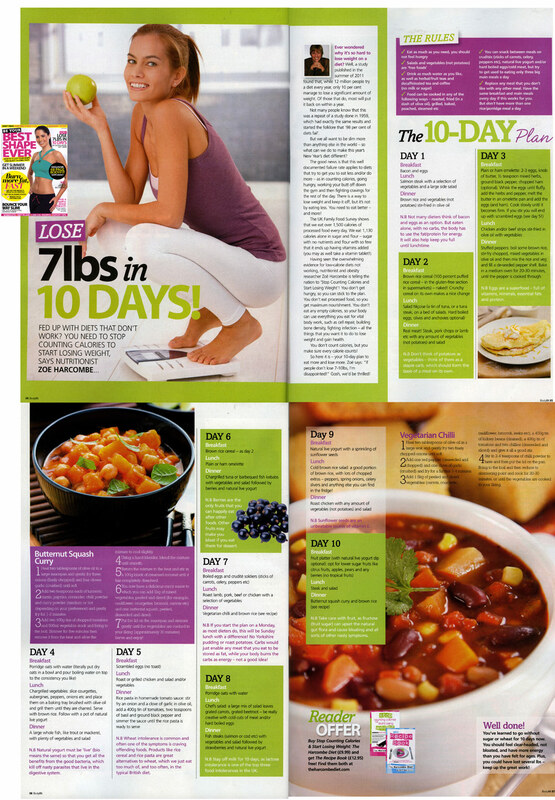 June 2009 Women’s Fitness Magazine – The Dangers of Dieting. 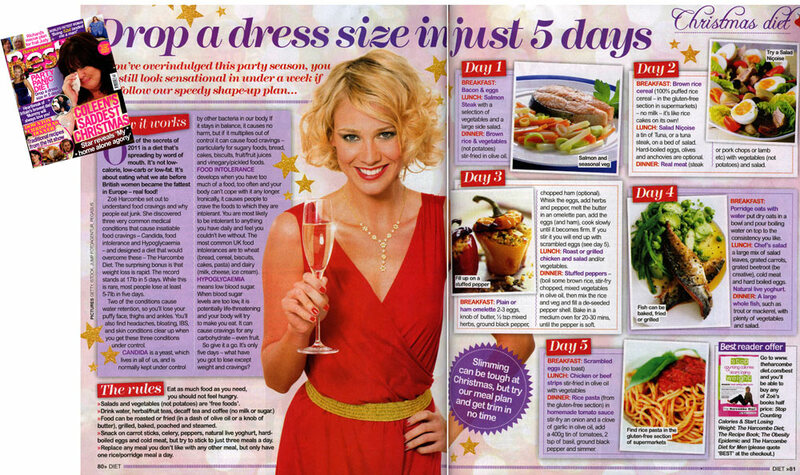 14/06/09 Sunday Mirror – Celebs on Sunday – Countdown to the beach. 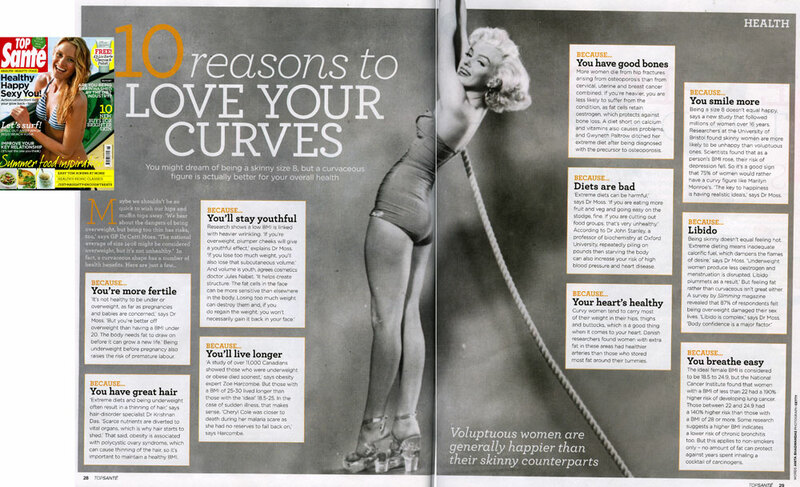 05/06/09 Heat Magazine – Young and curvy vs old and skinny. 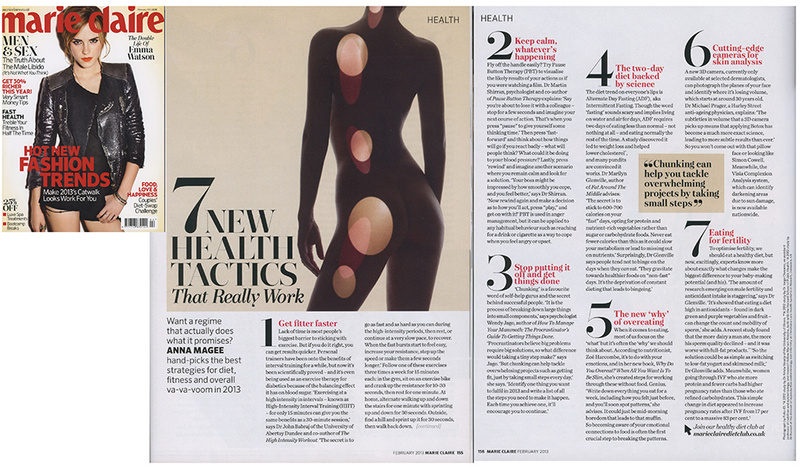 February 2009 – Psychologies Magazine – 8 Ways to Sabotage our Weight Loss. 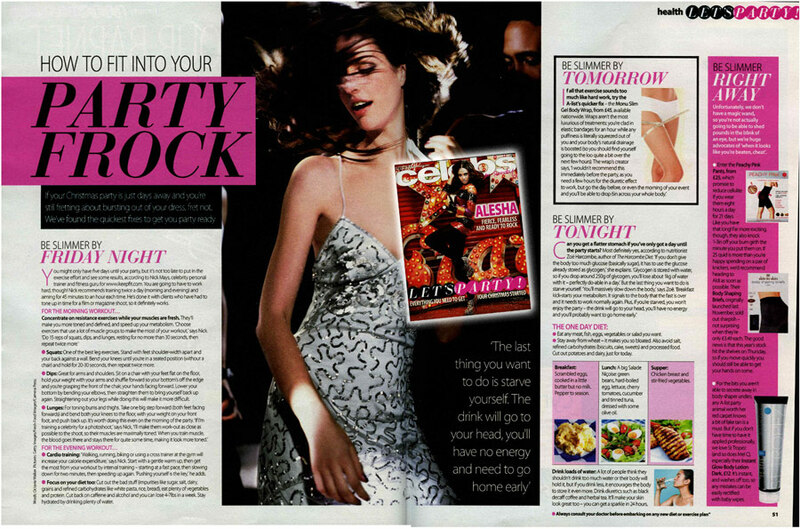 31/01/09 Closer Magazine – Are Detoxes Worth the Cash?